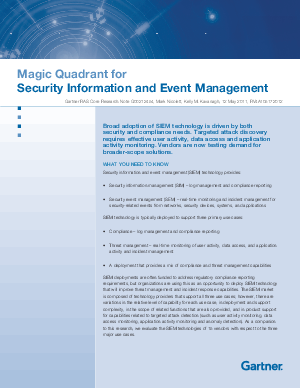 ArcSight, an HP Company, has been positioned by Gartner, Inc. in the Leaders Quadrant of the 2011 Magic Quadrant for SIEM. The Magic Quadrant evaluates vendors based on their Completeness of Vision and Ability to Execute and positions them in one of the following quadrants: Leaders, Challengers, Visionaries or Niche Players. According to the research report by Mark Nicholett and Kelly M. Kavanagh published on May 12, 2011, "The SIEM Leaders quadrant is composed of vendors that provide products that are a good functional match to general market requirements, have been the most successful in building an installed base and revenue stream within the SIEM market, and have a relatively high viability rating (due to SIEM revenue, or SIEM revenue in combination with revenue from other sources). In addition to providing a technology that is a good match to current customer requirements, Leaders also show evidence of superior vision and execution for anticipated requirements. Leaders typically have relatively high market share and/or strong revenue growth, and have demonstrated positive customer feedback for effective SIEM capabilities and related service and support."